What do you do when the world's most famous atheist mocks and insults you on international television, in universities, and throughout social media? You look to the Bible and see how Joseph was humiliated before the time came when God opened a big door of opportunity for him, and how Moses was abased before God opened a big sea for him. You take comfort in the Scriptures-in the knowledge that those who trusted God were often the object of "cruel mockings," and in the principle of humiliation before promotion, of God taking someone low before raising them up for His use. And that's precisely what happened when Ray Comfort was christened "Banana Man" by Professor Richard Dawkins and then mocked worldwide by the atheist community. It was then that something strange and wonderful began to happen. Millions came under the sound of the everlasting gospel, all because of that humiliating name: Banana Man. So if you're afraid of looking foolish as a Christian, this true story not only will fascinate, delight, and encourage you, it will help you to see God's hand in your life and bring your own fears into perspective. The true story of how a demeaning nickname opened amazing doors for the gospel--and how you can overcome your own fears in sharing your faith. Millions came under the sound of the everlasting gospel, all because of that humiliating name: Banana Man. 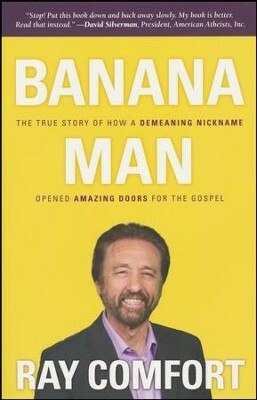 Learn how being christened Banana Man by Professor Richard Dawkins and being mocked worldwide by the atheist community led to a worldwide evangelism ministry. Be inspired, fascinated and delighted while this autobiography brings your own fears into perspective. Ray is the Founder and CEO of Living Waters and the best-selling author of more than 80 books, including, Hell's Best Kept Secret, Scientific Facts in the Bible, and The Evidence Bible. He co-hosts (with actor Kirk Cameron) the award-winning television program "The Way of the Master," seen in 200 countries. He is also the Executive Producer on the movies "Audacity," "180," "Evolution vs. God," and others, which have been seen by millions. He and his wife, Sue, live in Southern California, where they have three grown children. I'm the author/artist and I want to review Banana Man: The True Story of how a Demeaning Nickname Opened Amazing Doors for the Gospel.